While in Kathmandu visit to three Durbar Squares is a must. Historically the valley of Kathmandu was divided into three kingdoms namely Kasthamandap, Patan and Bhadgaaon (Bhaktapur) with three separate Durbar (Palace) Squares. The durbar squares are like an open museum, where you can see the traditional architecture. It also gives you a glimpse into the culture of the ‘Newars’ indigenous inhabitants of the Kathmandu valley. Sadly the earthquake of 2015 had damaged parts of the Durbar Squares, but reconstruction is underway, so paying a visit to these spectacular Durbar Squares is much worth it. 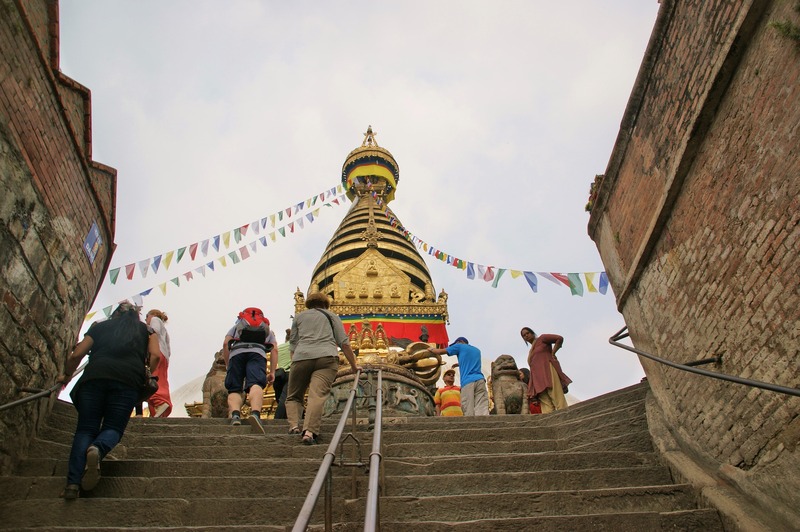 One of the top attraction in Kathmandu for both domestic and International Tourists is the Swayambhunath Stupa, popularly known as the Monkey Temple. Situated on a small hilltop is the gold stupa of Swayambhunath with famous Buddha Eyes or the eyes of peace. Swayambhunath has one of the best panoramic views of Kathmandu Valley. You’ll see a lot of monkeys here, which is why it is referred to as the Monkey Temple. It’s advised to stay away from the monkey found in the vicinity as they can get aggressive sometimes. Situated at the northeastern side of Kathmandu, Boudhanath is one of the largest Buddhist Stupa in Nepal. It is also the cultural center of Tibetan Buddhism in Nepal. The evening at Boudha is very delightful. You can light the butter lamps and take a Kora (circumambulation) around the stupa. The area also houses many Tibetan food restaurants. You can head out to one of these for dinner. You’ll also find a lot of curio shops, filled with traditional Tibetan handicraft and arts at Boudhanath. If you are time constrained and have a desire to see the majestic peaks of Mount Everest, mountain flight is one way you can do. Mountain flight offers a stunning view of Mount Everest as you cruise up in the clouds. You can also go on Heli Tours, which offers an exciting experience to view the world’s highest peak. The vibrant streets of Thamel are packed with curio shops, book and coffee shops, and restaurants serving different cuisines. You’ll also find numerous trekking shops if you still have some last minute supplies to purchase.